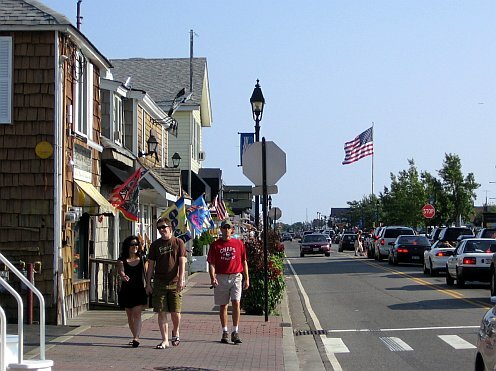 Long Island is one of the most unique destinations in the country. Our beaches, wineries, restaurants and farms are just a few of the reasons why so many people love visiting and exploring this beautiful place. A romantic sunset on the Great South Bay. Sun yourself on the best beaches in the world, enjoy some of the finest food and wine in the world, and have a fantastic night out in the greatest city in the world. All within an hour or less from home and at a price that won't break your budget. Where else can you do that? Beaches and wineries are our biggest attractions. Most tourists come here for Jones Beach, Fire island, and the bucolic east end. The east end is divided into two sections: the North Fork and the South Fork. A bird's eye view showing the major areas of interest. The North Fork is our agricultural center and is where most of our wineries are located. The South Fork is where you'll find the Hamptons and Montauk Point. Between the forks is Shelter Island, a world unto itself. Head west for about an hour and you'll find yourself in the greatest city in the world, New York. If you can't find it in New York; it just doesn't exist. On this website I show you Long Island as I've experienced it with family and friends. You'll see the places I love, the restaurants I've enjoyed, our main attractions and best kept secrets, and reviews of some select small businesses that I find special in some way. Generally, if I find it interesting, I write about it here. 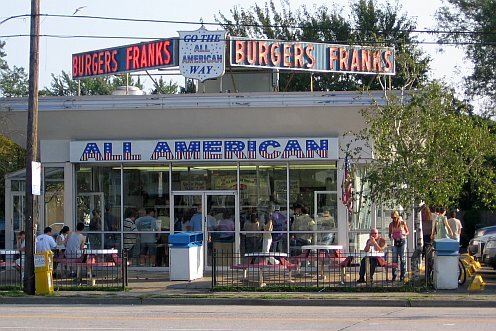 All American is probably our best hamburger stand. You'll wait on line, but it's worth it. Occasionally other passionate Long Islanders will share their experiences as well, and I encourage contributions from anyone who has something positive to share. You don't have to be a professional writer (I'm certainly not), just someone with a story to tell. 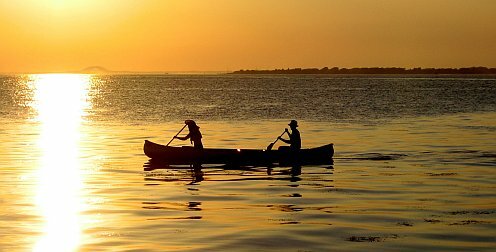 Loving-Long-Island.com is all about the great things to do and see on Long Island. I won't waste your time or mine with bad reviews about places that are not worth a second trip. If I'm not going back, I won't send you there. 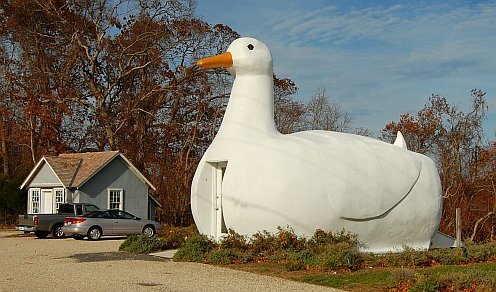 The Big Duck in Flanders. A worthy waypoint on your East End itinerary. You also won't find brief, one or two paragraph descriptions of places I know nothing about. If I haven't been there myself, you won't see it here. I built this site for native Long Islanders and tourists alike. With the bad economy people are staying closer to home when they vacation. A source of ideas for things to see and do here can help make the most of a "staycation." Enjoy a day on Freeport's Nautical Mile for the price of dinner and drinks. If you're a first time or returning visitor I hope you enjoy your stay and come back again. If there's something you want to know and can't find it here please feel free to contact me with any questions that you may have. Want to try something cool? Get in the car and head east. North Fork, South Fork, it doesn't matter. Take in the sights & sounds, and stop somewhere for lunch. After lunch find your way to the Shelter Island ferry (it runs every ten minutes until midnight all year long) and enjoy the ride. 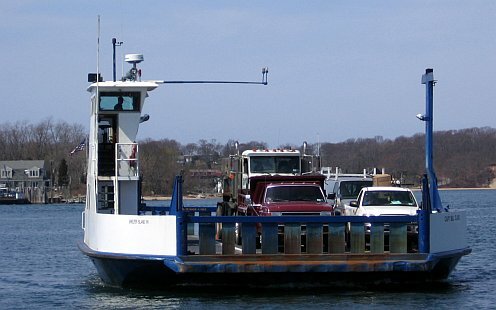 The Shelter Island Ferry. Drive on. Enjoy the scenic ride. Drive off. Poke around Shelter Island for a while and then take the opposite ferry to the other fork. Take in the sights & sounds, and stop somewhere for dinner before heading home. You'll make this trip again and again and it'll be different each time as you discover new things to see and do. There are 4 ways to make Loving-Long-Island.com visit you. 1) The Long Island newsletter. This free newsletter is delivered monthly, straight to your INBOX. It covers all new pages since the last issue and includes the exclusive Photo of the Month. 2) All new additions to this website, special postings, rants, whatever, happen on the Long Island blog. Subscribe with your favorite RSS reader including Google Reader, My Yahoo!, etc. 3) Twitter. Be notified of updates the second they happen and even tweet back to me if you like. Follow me here. 4) Facebook. Go to my Facebook page and click Like. Ready to start exploring Long Island? Use the menu at left for some ideas, then get in the car and have fun. And if you discover something cool along the way, be sure to let me know about it.